Probably one of the commonest of the lowland species of eyebrights. All names: Euphrasia nemorosa (Pers.) Wallr. 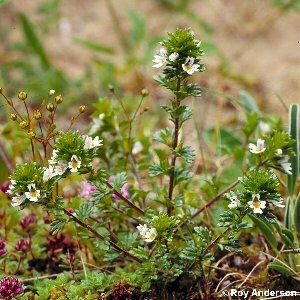 ; Euphrasia curta (Fries) Wettst. ; Euphrasia officianalis ssp. nemorosa Pers. ; Euphrasia stricta auct.